The Château de Coucy is a castle complex in Aisne, northern France. 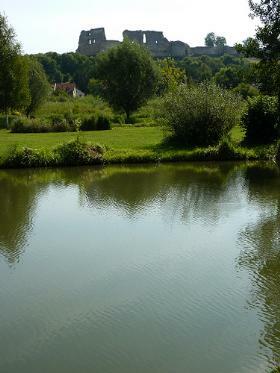 The castle was built between 1225 and 1242 on a spur overlooking the valley of the River Ailette between Soissons and Laon, which cuts the road to St Quentin. A colossal feudal fortress, strongly fortified by the lords of Coucy, who were rich enough in territory and alliances to erect an extraordinary building, it commands the lines of approach from c. 10 km in every direction. 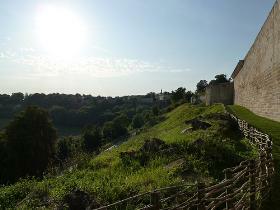 The site was mentioned as early as the 9th century, and in the 10th century it was already one of the most important feudal bases of the French kings; however, the complex visible today—castle, outer bailey and walled town—was built by Enguerrand III, Lord of Coucy, between 1225 and 1242. 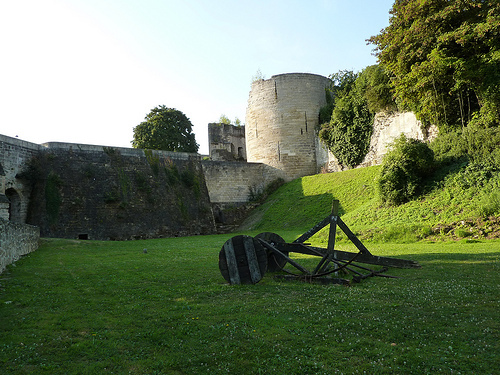 This great baron joined a revolt against Louis IX during the regency of Blanche of Castile, and it was at this time that he erected the fortifications as a direct challenge to royal power. Château de Coucy at the extremity of the spur, is an irregular quadrilateral defended by four circular towers each nearly 20 m in diameter, far larger than those of the royal donjons built all over France in the first quarter of the 13th century. These towers contain hexagonal rib-vaulted chambers defended by arrow loops. In the middle of the south-east curtain wall facing the plateau, Enguerrand built an impressive donjon 31.25 m in diameter and 54 m high from the bottom of the moat, with walls 7.5 m thick at their base. It was surrounded on two-thirds of its circumference by a revetment wall. 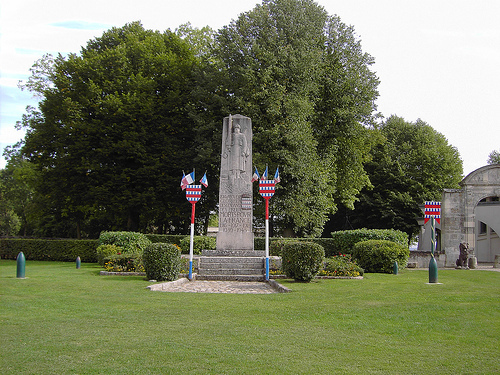 The donjon was entirely destroyed in 1918. The enormous tower had only three storeys, each rib-vaulted and nearly 15 m high, equivalent to five floors of a modern block of flats. At the top was a parapet with pointed crenellations, which once gave access to wooden hoardings supported on stone corbels. 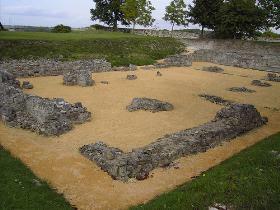 Inside the castle enclosure are the ruins of a 13th-century chapel. The residential buildings along the south-west and north-west walls were entirely renovated and redecorated before 1386 by Enguerrand VII of Coucy. 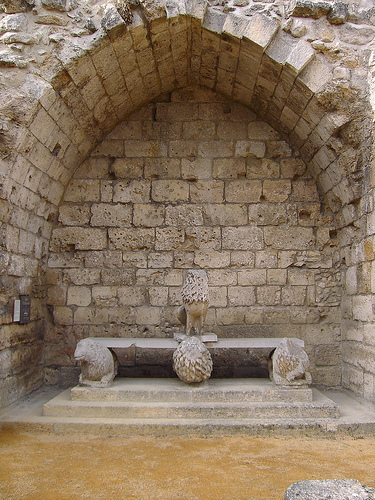 Above lofty cellars, the state rooms with large traceried windows were adorned with stained glass and statues of the Nine Heroes and Heroines, historical and mythological figures celebrated in chivalric literature. Impressive remnants survive today, testimony to the desire for ostentation and luxury shown by builders in the late 14th century at the height of the Hundred Years War. The fortification of the site also includes the wall of the town itself, with the Porte de Laon, its most prestigious feature. This magnificent structure was built in the 1240s and is remarkably well preserved. It is flanked by two circular towers with long arrow loops, and the entrance passage is defended by two portcullises and a murder hole, with guard rooms above and a long, vaulted corridor underneath leading to a barbican, which was entirely rebuilt in the 16th century. 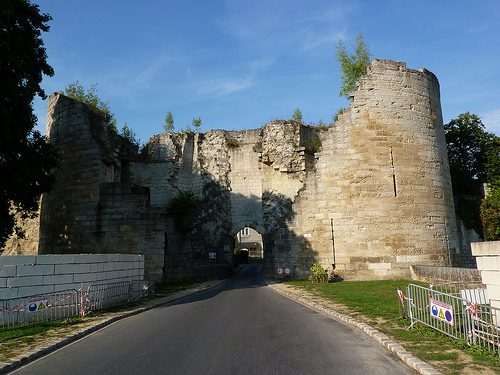 The rest of the wall was defended by round towers, 12 of them dating from the 13th century; it has been renovated many times, as can be seen, for example, in the cannon loops visible at the Porte de Chauny. Inside the wall, a fine Gothic church and medieval houses help to make Coucy one of the most representative sites of medieval architecture. Even without the donjon, it is architecturally and historically an incomparable fortified site. 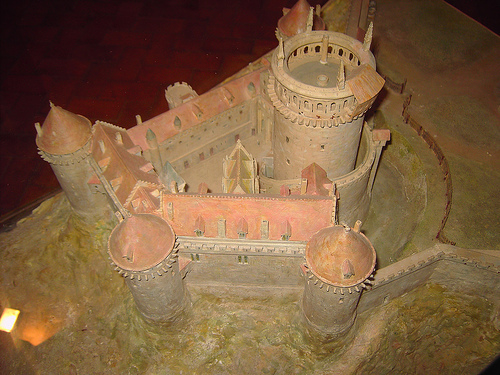 As military architecture, Coucy is a clear example of principles defined by the royal architects in the first third of the 13th century, while the Porte de Laon, probably the latest building, represents a more advanced current, linked with such examples of Louis IX’s fortifications as the castles of Carcassonne and Angers. Coucy Castle is managed by The Centre des monuments nationaux (Centre of National Monuments) of France.